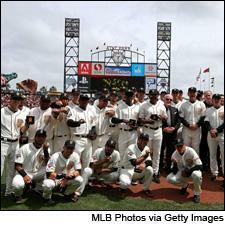 The Giants now have two new sparkling wines to go with their most recent two sparkling World Series rings. • Last season, Unfiltered reported that the San Francisco Giants were celebrating their World Series Championship playoff run with Mumm Napa Brut Napa Valley Prestige. This week, the Giants announced they would add Mumm to their roster for good. Mumm and the Giants have teamed up to create two Napa Valley sparkling wines. Baseball-loving wine collectors can swing for the fences with the limited-edition Championship Brut ($125). There are 2,012 bottles of the cuvée commemorating the Giants' 2012 World Series Championship, and every Giants player will receive a bottle of the Championship Brut with an etched label featuring their name and number. If you're looking to fill your ballpark collector's cup each game, the Giants Brut Prestige ($27) will be available at AT&T Park, select restaurants, bars and retailers, and can be found online at sfgiants.com/wine. "Mumm Napa has been the celebratory sparkling wine of choice for both our 2010 and 2012 World Series Championships," said senior vice president of Giants business operations Mario Alioto. "We are pleased to extend this relationship with Mumm Napa to our fans in 2013, with the creation of these unique Giants wines." The wines will also be featured at tastings during select games, in the ballpark at special events throughout the season and, of course, at future team celebrations. • Unfiltered declined to take a paddle, lest any auction accidents spill our year's rent money, but that made little difference in the success of the Heart's Delight charity extravaganza in Washington, D.C., this past weekend. Over four days, attendees ponied up $1.2 million for the American Heart Association, helped along by an unexpectedly ardent crowd at the Friday night live auction, one of four over the course of the weekend. The $352,700 total haul bested last year's $284,900. "I think it definitely had a feeling of celebration with chefs coming in and winemakers from Bordeaux and the U.S.," said organizer Heidi Arnold. "It was great energy—I know that sounds a little hippie-ish—but the whole thing felt really exciting." Michel Rostang flew in from Paris to cook up sturgeon caviar flecked with gold flakes, turbot, short ribs and more. To loosen up guests and their wallets, a bit of 2004 Marguax, 2006 Haut-Brion, 1999 Mouton and 2001 Guiraud was splashed around as well. After introductory remarks by chairman Nick Calio and a bipartisan team of Congressmen Bill Shuster (R-Pa.) and John Larson (D-Conn., "best bocce ball player in Congress"), the bidding began with large-format Bordeaux, presented by the winemakers themselves. Right off the bat, a double-magnum of Château Coutet 2010, valued at $300, came to almost $3,000 when the gavel fell. The pattern continued, with bottles flying at 500 to 900 percent over estimated value (200 percent is the auction's norm, Arnold said). By the time owner Alfred Tesseron went onstage with a double-magnum of his Pontet-Canet 2010, valued at $1,200, bidders chased it to $6,000. "I have not seen this in eight years" of attending, a guest at Unfiltered's table marveled. The next day's auction would repeat the experience, but with celebrated chefs offering tastings at spots like La Toque in Napa and Del Posto in New York. It was a bells-and-whistles trip to next year's Cannes Film Festival, stuffed with all manner of lunches and galas, that proved the top prize, however: The lot went twice, pouring another $110,000 into the fight against heart disease. • For those about to rock … Napa hopes it's ready. BottleRock, Napa Valley's most ambitious festival yet, begins today, flooding Napa with as many as 40,000 festival-goers a day through May 12. In the vein of San Francisco's Outside Lands and Brooklyn, N.Y.'s Great GoogaMooga festival (more on that event's impending sophomore effort in the coming weeks), BottleRock is a combo music, wine, beer and food festival, with dozens of top local restaurants (Morimoto Napa, Tra Vigne, Azzuro Pizzeria, La Toque, Oenotri, Gott’s Roadside, to name but a few) serving food and about 50 wineries pouring for thirsty fans, including Miner Family (sponsoring one of BottleRock's three main stages), Silver Oak, Rombauer, Grgich, Delectus and St. Supery. In addition to the economic boom of a long weekend of overbooked hotels and restaurants, all that hedonism is benefiting Napa through a new charity, as well. BottleRock Napa Valley was created to support more than a dozen local and national charities, including Wildlife Rescue Center of Napa County, Napa Valley Education Foundation, Land Trust of Napa County and the Breast Cancer Fund through BACCHUS Benefits Group, which includes the Bottoms Up for Bacchus program: For every beverage purchased at BottleRock (water, soda, beer, wine, etc. ), $1 will be distributed to charity. Which rocks. Speaking of which, there are some bands playing at this event, too: Jane's Addiction, Kings of Leon, the Black Keys, the Flaming Lips, Primus, Cake, Zac Brown Band, Train, Ben Harper, Dwight Yoakam, the Black Crowes … that sort of thing. To be sure, Unfiltered's spies will be everywhere. Stay tuned to hear how it all plays out.